Trekkers around Mumbai can visit Sagargad a.k.a. Kheddurg all year round. This fort was built to keep an eye on the shores of Alibaug and Dharamtar creek. Until the establishment of forts like Khanderi, Kulaba and Sarjekot by Chhatrapati Shivaji Maharaj, the onus of protection of the coast around Alibaug was on Sagargad alone. It should be noted that although the fort is called Sagargad (Sagar = sea, Gad = fort), the fort itself is 5 miles from the sea. Very less is known about the origin of the fort or who built it. Shivaji Maharaj won the fort from Adilshaha in 1660 A.D. It is said that he saw the islands Khanderi and Underi (known as Hunarey and Cunarey in the British regime) from the fort and decided to fortify Khanderi. This was to keep a check on the trade route used by the British. Sagargad was one of the 23 forts handed over to Mughals in the treaty of Purandar in 1665 A.D. Shivaji Maharaj won the fort back after he escaped from Agra. During the anarchy after the death of Sambhaji Maharaj, Sagargad was won by Siddi of Janjira. In 1698, Kanhoji Angre, Bhivaji Gujar of Kulaba and naval chief Sidhoji won back the fort from Siddi. Later Kanhoji Angre sided with Tarabai during the fight between Tarabai and Shahu Maharaj for the throne. But in 1713, Balaji Vishwanath Peshwe orchestrated a compromise between Kanhoji Angre and Shahu Maharaj. Along with Sagargad, 16 forts were given to Kanhoji. After Kanhoji�s death, the possession of Sagargad transferred to Yesaji. There was an altercation between Yesaji and his brother Manoji. Manoji sought help from Portuguese and won the fort from Yesaji. In 1738 A.D., Sambhaji Angre won the fort from Manoji. The possession of fort went to British after the defeat of Marathas in the war at Pune. Seeing the attractive scenery and pleasant atmosphere, General Fuller and some British officers built rest houses on the fort. The way to reach the fort is through Khandale village situated on Mumbai-Alibaug road.. 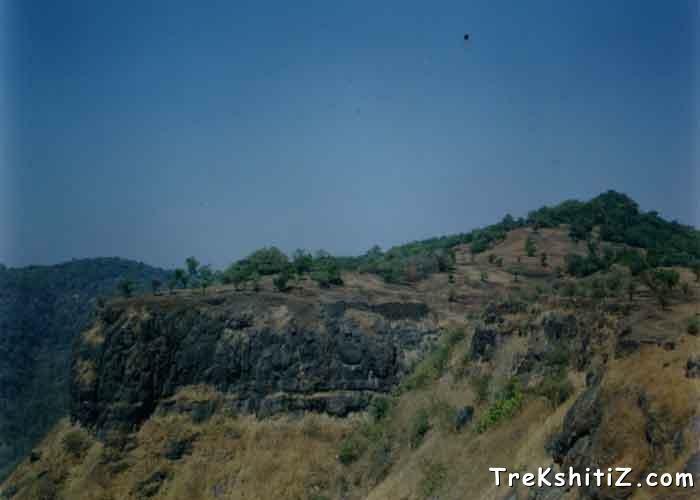 The way to the fort is an unpaved path which is on the left side of the road towards Alibaug. The path to the fort is marked trail and takes 2 hours to reach the top. On the way to the fort, one can see �Dhondane� falls in monsoon. Right above this fall is the Siddheshwar Temple and an old monastery. Main entrance of Sagargad is in dilapidated state. Sagargad has a peculiar �Y-shape� if seen from aerial view. On the left side of the fork of this �Y� is a tall peak called �Vanartok�. Sagargad is fortified by 4 m tall walls, and the citadel inside is strengthened by 5 bastions. There is a moat near the eastern ramparts which is now defunct. There is a secret door here. We can enter the citadel by climbing over this wall. There is a small temple here which comprises idols of Lord Ganesh and Mahishasurmardini Devi (Goddess Durga), and a Shivalinga. There is a small tank near the temple which is fed from spring water source through a snout called Gomukh or Mouth of a Cow. The fork on the fort starts at some distance from the tank. On the right limb is a tomb with a woman�s hand carved on it. This is called �Saticha Mal� and is dedicated to a Sati. On the left limb are the remnants of the rest houses. Khandale village is situated on the Mumbai � Alibaug road. While travelling to Alibaug, one can reach Khandale village after crossing Karla pass. The village is about 4 miles from Alibaug. Since the road to the foot of Sagargad is unpaved, we can reach there by car except in monsoon. After crossing a small stream here, one has to climb up on stairs built in rocks. After about half an hour the path splits 2 ways. The way right takes us to a point where we can see beautiful the Dhondane falls. And the way to right takes us to the fort top. There is another road to the fort from Poinad village via Wagholi. Poinad is situated on the Mumbai � Alibaug road before the Karla pass. There is another path to the fort from the village Vadavali. There is no place on the fort to stay overnight. One can stay in the Siddheshwar temple or at the school in Sagargad Machi. There is a community center at the Khandale village where overnight stay is possible. There is no facility for food on the fort. Packed lunch is necessary.